Generally, fairly small pieces of meat are used (occasionally small enough to be skewered for grilling), but I am using a pretty large piece for today’s preparation. I purchased a small oven roast and trimmed it to leave a rectangular piece (on the right) of about a pound or so. The trimmed pieces will be used elsewhere. It is not critical that you make a rectangle, but this makes grilling easier and, depending upon the finished dish, helps result in nicer slices for presentation. Grilling is very straightforward and simply requires searing the meat on all sides (don’t forget the ends) for about a minute or so (or as little as 30 seconds for very small pieces). This can be done on a barbecue but, if you do this (and want to be very traditionally Japanese) avoid leaving ‘grill-marks’ on the surfaces if possible. My barbecue season has ended and so I pan-fried at maximum heat, using just a little oil to prevent sticking. 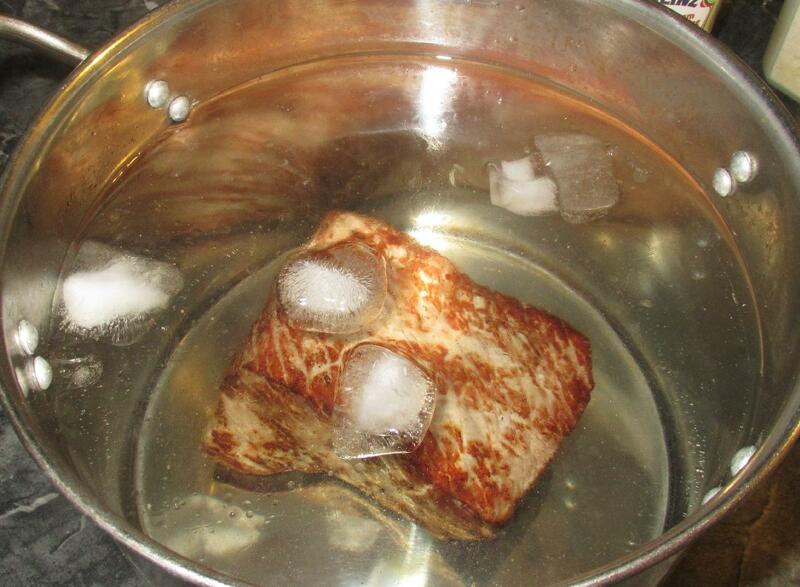 As soon as the meat has been browned on all sides, immediately plunge it into a bath of ice-water to prevent further cooking and leave to sit for a few minutes. 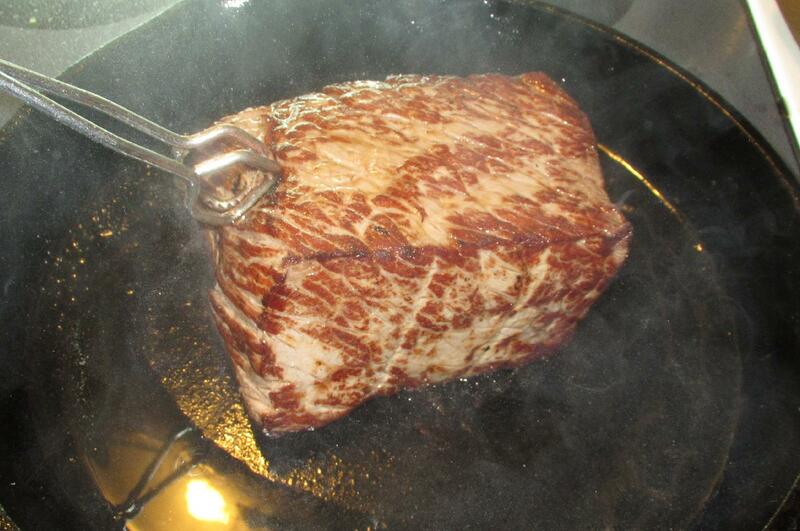 When the meat is cool, pat it well to dry and remove any excess oil. At this point, many recipes call for the meat to be marinated, usually in a soy based marinade. Really, this is only useful for very small pieces as any marinade will barely penetrate anything larger and any additional flavoring can easily be added once everything is sliced for service. 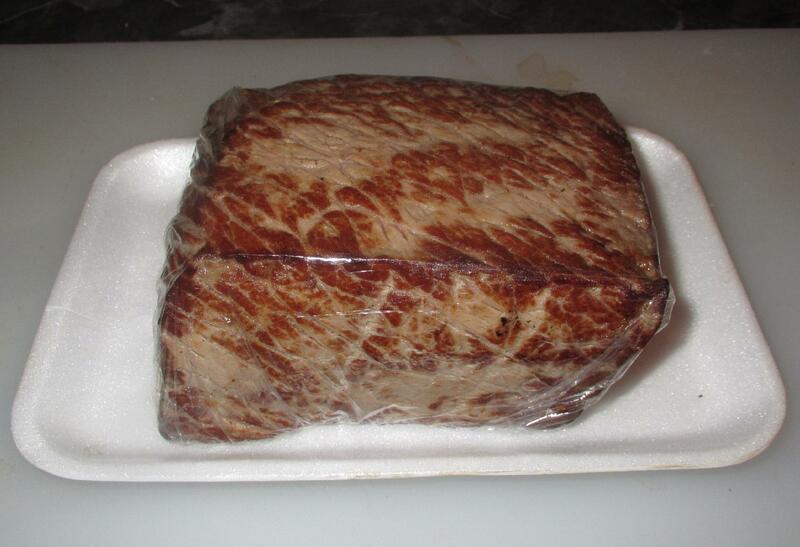 If you are not going to marinate, wrap the piece tightly in plastic film until ready to use. 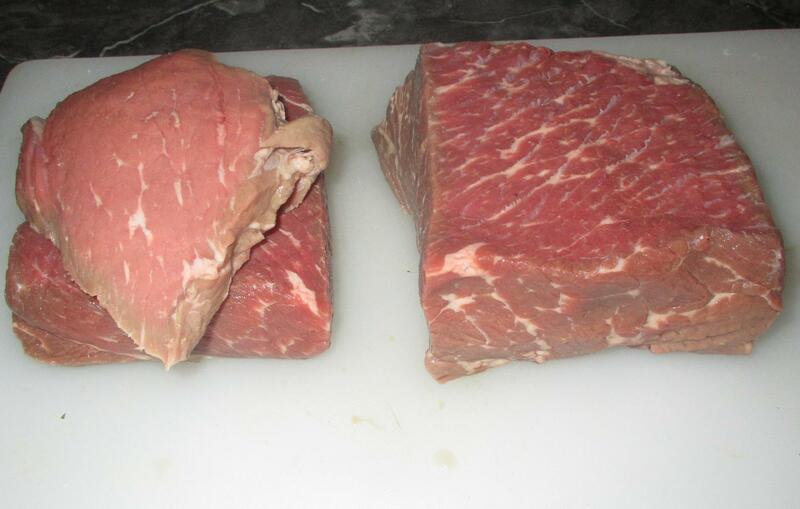 For service, the meat is typically cut into slices of about 1/8 to 1/4 of an inch. Make sure you use a good sharp knife (I used my Japanese Yanagiba sashimi blade) and try to employ good clean strokes rather than a sawing motion. 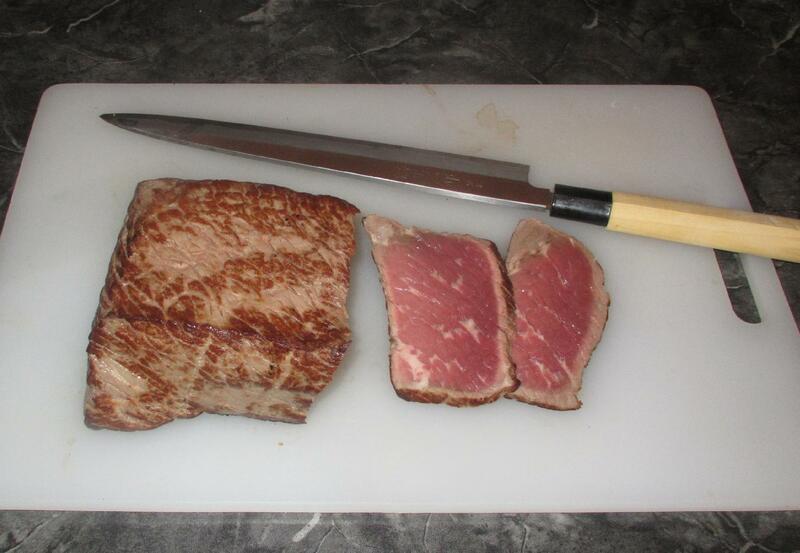 Here, you can see how the slices have a nice thin border of seared meat while the interior is still beautifully pink. That’s a nice piece of beef and an interesting technique. Some Italian restaurants have served me something they called “tataki”, which was seared over (very) high charcoal heat but also served warm. Good point you made about marinating. 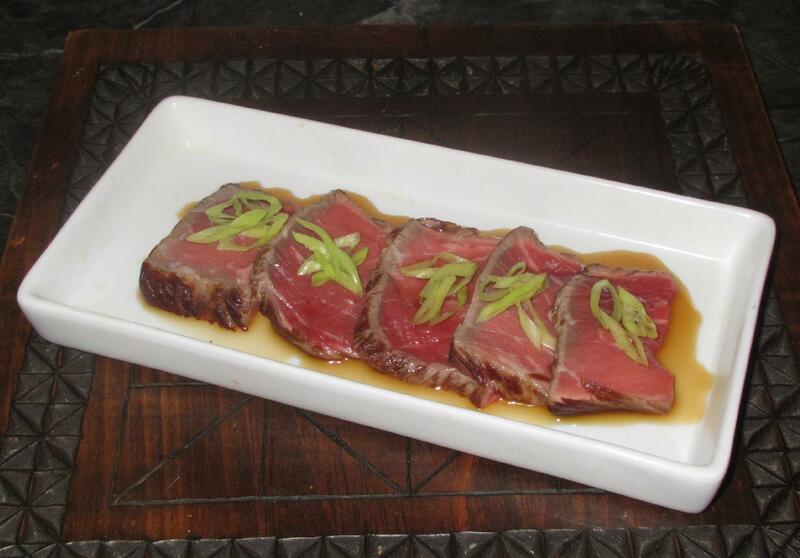 I love your version of beef tataki, well done!